We are now in the sun sign of Aquarius (January 20 – February 19). 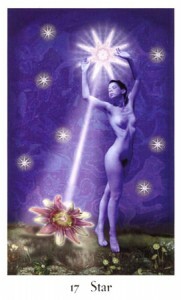 Aquarius is represented by the Star in the Tarot (Major Arcana, #17)*. The Star is a symbol of hope and knowing that everything will be OK. In general this month, you might feel a renewed sense of faith in humanity (or find yourself shaking your head at what you may perceive as the collapse of society). You may find peace within certain relationships at this time, especially those which have been mentally and emotionally burdensome lately. This often happens through the air sign quality of thoughtful reflection, putting the heart in the corner while the adults talk. Peace can be obtained with thoughtful and truthful reflection. This may be especially so as we move into February, away from the hostilities of the 5 of Swords (January 20 – 30). The 6 of Swords (January 31 – February 9) rules the mid-period of the sign. It’s time to look up and know that calmer waters are ahead, often through movement or change of direction. I find it very interesting that Valentine’s Day is in the sign of Aquarius, especially during the time of the 7 of Swords (February 10 – 19). The 7 of Swords can often mean “secrets”, and if you know the story of St. Valentine, you know it was secret love and marriage which created his lore and legacy. This next month is a time to allow the mind to process the ideas of the emotions and ego. Like the lady at the water’s edge, it’s time for some self-reflection, gaining refreshment and renewing yourself for the countless possibilities which still await you. From the “Cosmic Tribe Tarot” deck by Stevee Postman. I love this deck! As it did in the story with the Three Wise Men, The Star can keep you on the right path. Those born under the sign of Aquarius are often found looking to the future. The Star is seeing the “light at the end of the tunnel” after trial and tribulation. It won’t help you avoid those trials, but it will help you get through them. Those under this card are often creating new plans that could have positive repercussions well into the future. Aquarians are on a perpetual journey of self-discovery, and after reflection, they often find that everything is as it should be. Things will work out the way they are supposed to in the grand scheme of things. Some may make assumptions that those born under this air sign or rather cold and unfeeling. This couldn’t be further from the truth. Aquarians feel very deeply; however, they are masters of intellect, and reason will almost always rule the day over emotion for them. The heart must sit in the corner while the adults talk. If the energy of the Star is manifested in a negative light, it could lead to despair and conflict within and with others. It can bring discouragement and even deceitful words and actions. A sad, unawakened Aquarian is the epitome of the doom and gloom mentality. Negative thoughts can end up taking too much time and energy. Move past them by recognizing your mental habits, and come back to your true positive nature. astrology, faith, peace of mind, positive thinking, tarot, the star. Bookmark.